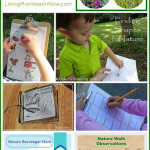 Whenever possible, it’s fun to take learning outdoors. Sometimes it’s difficult to know how to do that, though. 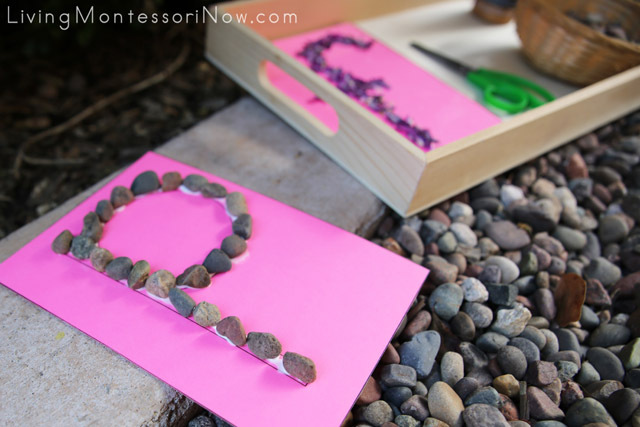 I found a fun way to take learning letter sounds outdoors with our tactile nature letters. 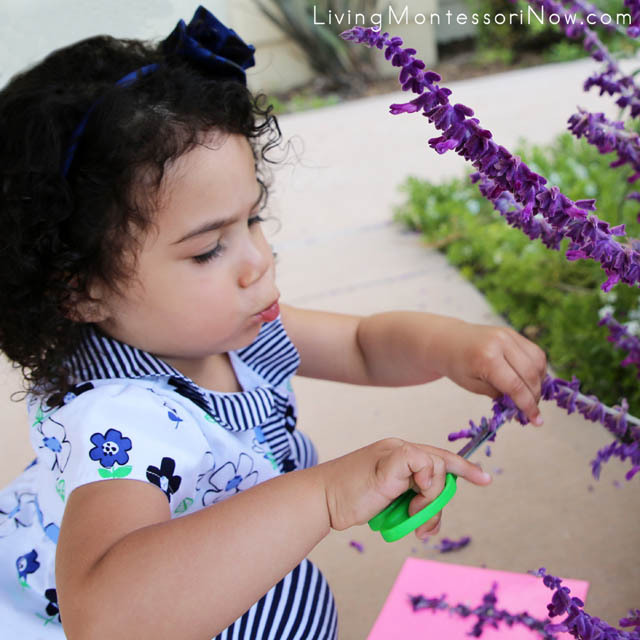 My 2½-year-old granddaughter, Zoey, my daughter, Christina (Zoey’s aunt), and I were able to combine a nature walk with work on fine-motor skills and learning phonetic letter sounds! 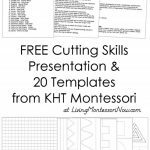 My daughter, Christina, and I designed these templates for you to print out on colored cardstock. I had colored cardstock for a number of years that I’ve been using, so I don’t know which exact brand I used. I just used 67 lb. cardstock, although heavier would probably work even better if your printer can handle it. That said, my 67 lb. cardstock worked very well the way I used it, which was to print out the letters and then laminate the letters before adding the glue and textures. We placed a, i, o, u, e, y first in the printable in case you want vowels in blue like the movable alphabet (or sandpaper letters + a blue y). 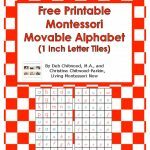 Then we placed all the consonants (including y as a consonant) that you could print out in pink to introduce in an order used in many Montessori schools. 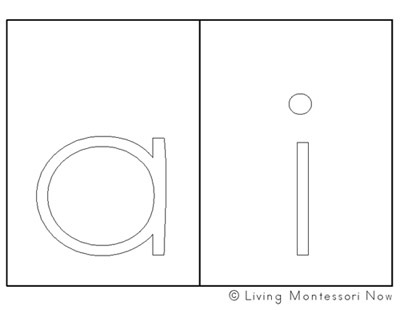 This order allows children to quickly form as many words as possible when learning the letter sounds. 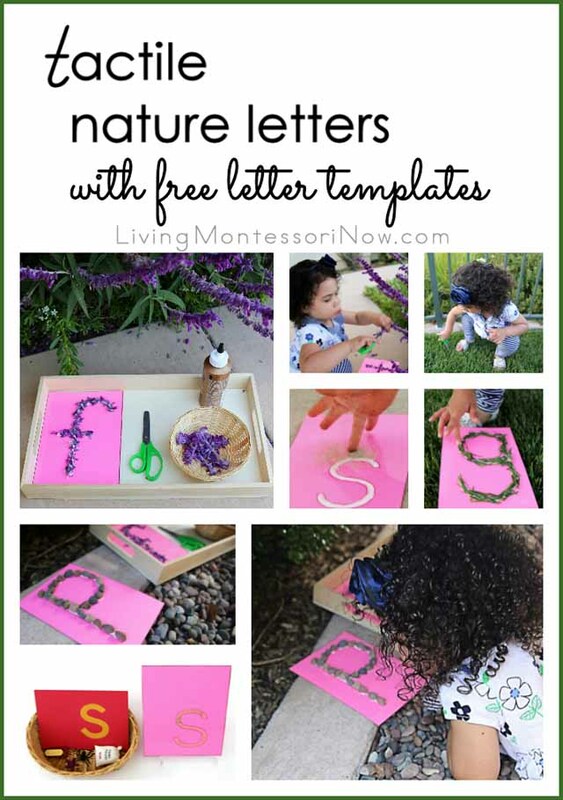 Our tactile nature letters tray includes the printed, laminated letters, Fiskar scissors, Aleene’s Turbo Tacky Glue (which was awesome for this), a Montessori Services basket to hold the cuttings or nature objects until we finished with the letter, and a Multicraft tray to hold everything. 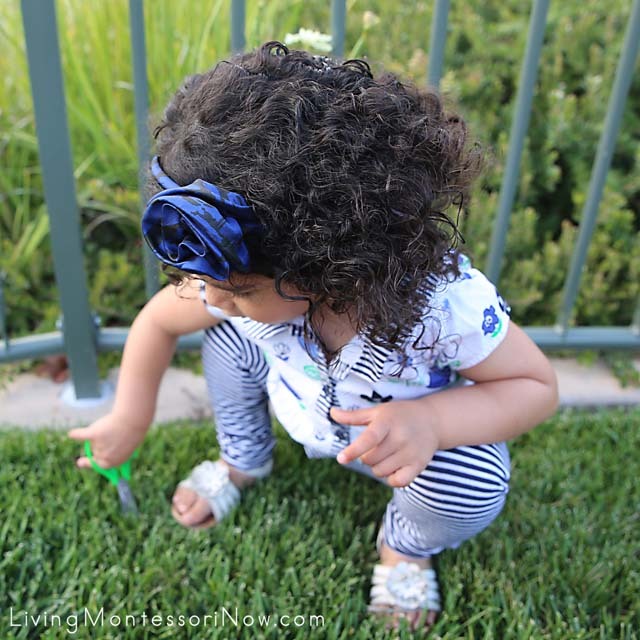 Zoey is proud of her developing scissor skills, which she used to cut flowers for the letter. 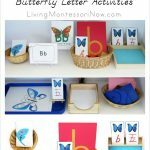 Some of the tactile nature letters won’t work exactly like sandpaper letters for tracing. 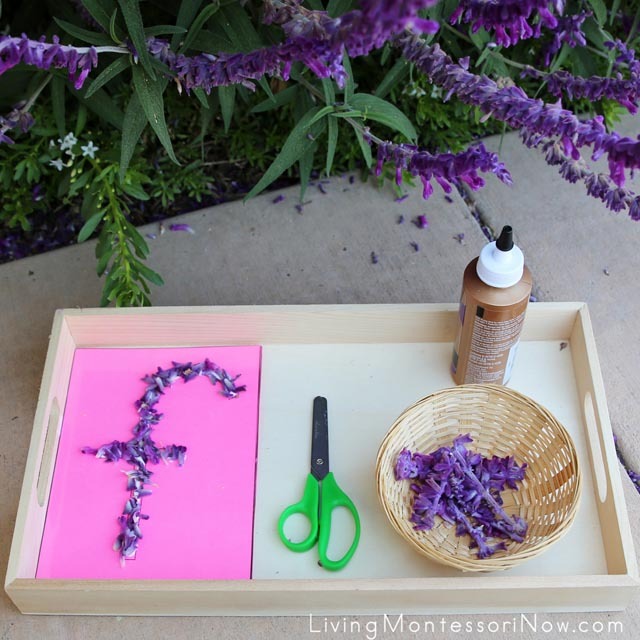 Some, like the flower letter f, are simply for gently feeling the texture of the natural objects and adding extra interest to learning letter sounds. Our next stop was for /p/ is for pebbles. 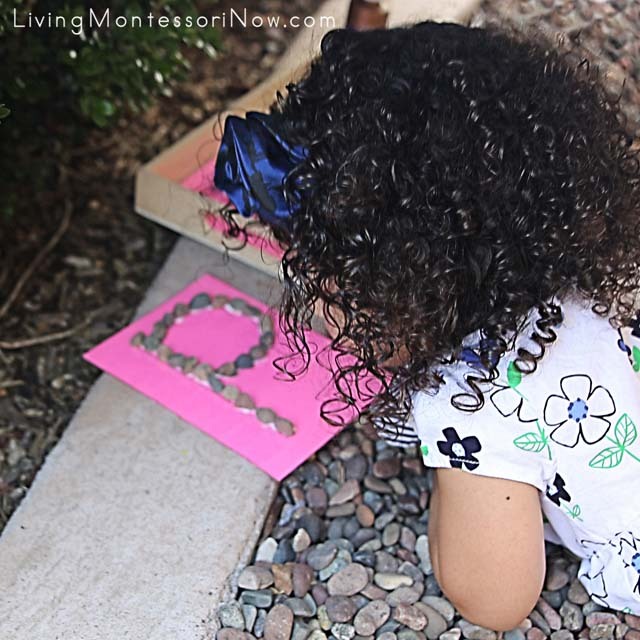 Zoey has loved any type of rock since she was a baby, so this was a natural for our tactile nature letters. This will definitely be a popular addition to our tactile letters! 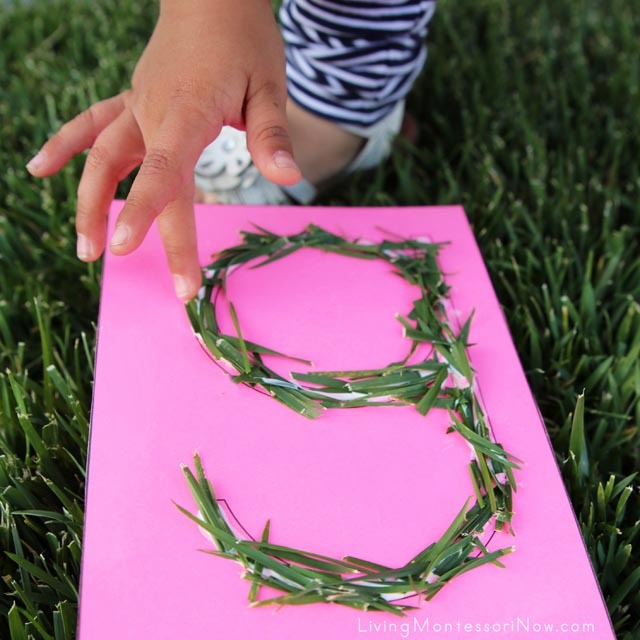 Zoey got to use her scissor skills again for our next tactile nature letter. We made /g/ for grass. Finally, we made, of course, /s/ for sand. 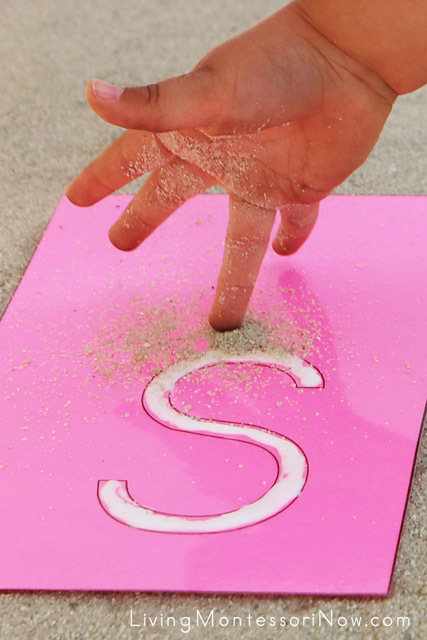 Zoey added the sand to the glue to make a real sand letter! We’re adding our nature tactile letters one at a time to our shelves when we want to focus on a particular sound. For example, we might add a sound basket with small objects, a sandpaper letter, and the tactile nature letter. See ideas for using language objects here. We only made four tactile letters, but it would be easy to add to our collection on any of our nature walks. Choose whichever letters you want to focus on or whichever natural objects you want to collect for your letters. 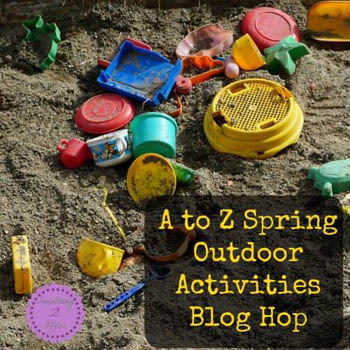 Thaleia from Something 2 Offer organized a fun A to Z Spring Outdoor Activities Blog Hop with a group of fabulous kid bloggers! 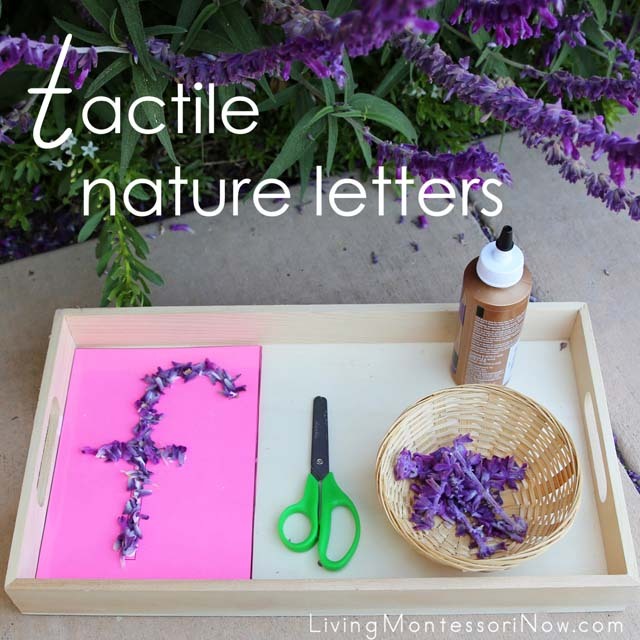 I have the letter T with my tactile nature letters! Check out all the letters in our blog hop! These are amazing! So beautiful and creative. I’m definitely going to try to make these with my daughter very soon. 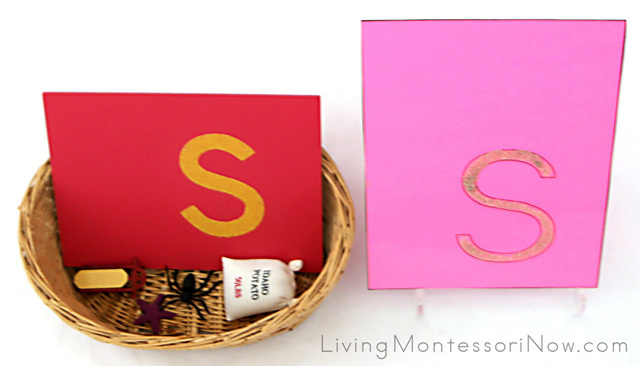 Aw, how beautiful are these letter sounds activities! Thanks for the great ideas and inspiration! I ABSOLUTELY love this article, Deb. Zoey is having a wonderful time and the creations are stunning! What a fun way to work on the alphabet! Not only does it involve multiple senses but it’s a great “excuse” to get outside! This is such a great idea! I need to go pick up cards took and glue. This is a fun idea. I bet the flowers smell really nice adding another scense to the game. What a fun idea. My daughter loves glue, I can only imagine the mess she will make with sand, and love every minuted of it! Great craft to do outside. I am looking for the rest of the lower case alphabet for do a dot. I have found f,c,s,b,and r only. Can I purchase them somewhere?